When on Skye take the A87 to Broadford then the single track B8083 for Elgol which takes approximately 45 minutes by car. The B8083 takes you through the beautiful Strathaird peninsula around scenic Loch Slapin and affords spectacular views of the Cuillin. Free car parking is available at Elgol Jetty. 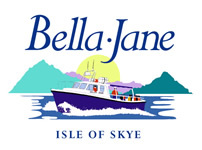 Look out for the Bella Jane Boat Trips & AquaXplore information signs, on your right at the car park 200 metres before the Elgol jetty and also fixed to the wall at the top left of the jetty itself. Our blue booking office is near to the top of the jetty. From Broadford usually takes 35 - 45 minutes. From Portree approx 1¼ to 1½ hrs. From Skye Bridge approx 1 hr.